Blackheads: What Are They? How Can I Get Rid of Them? So many people are obsessed with blackheads. We see them all over our faces and think that everyone can see them too. We desperately want to get rid of them and will try anything to do so. But do you even really know what blackheads are and how they are formed? What's the best way to get rid of them? Whiteheads and blackheads are very similar, with just a very slight difference. They are both called comedones, and each are formed when sebum (a fancy word for oil) and dead skin cells get trapped in your hair follicles. The difference between whiteheads and blackheads is simply if the hair follicle is open or closed. When you have an open comdone, the oxygen in the air oxidizes the trapped oils and skin cells turning them brown — this is a blackhead. This is the same thing that happens to a cut apple when left out in the air; it turns brown. A whitehead, on the other hand, is a closed or almost closed follicle, which prevents the oxygen from oxidizing the oil. Instead it appears like a white bump on your skin as opposed to a black or brown one. Contrary to their name, blackheads are not always black. They can be a range of color from yellowish to black. The light reflecting on the hair in your follicle can also make the blackhead appear to be a dark color. If you have blackheads, please do not think that it is because you do not clean your face well enough. 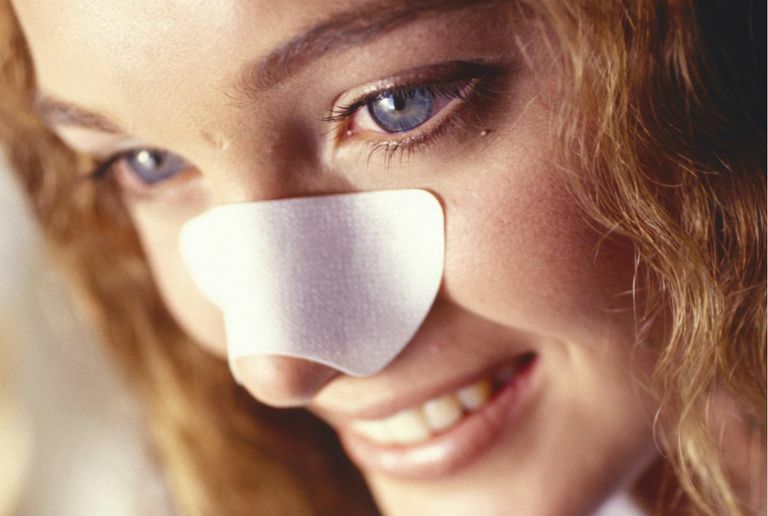 The cause of blackheads is all below the skin's surface. If you are cleaning your face daily you are not responsible for your skin's blackheads. Scrubbing your skin with harsh skin products will not get rid of blackheads. Where are the Most Common Places to Get Blackheads? Blackheads are most common on your face, specifically on your nose and the sides of your nose, the forehead and chin. But some people get blackheads in other places, such as their ears, shoulders, and on their back. Whiteheads and blackheads can actually form anywhere on your body there is a hair follicle. The key to getting rid of your blackheads is unplugging the pores and dislodging the buildup. While it might be tempting squeeze them out on your own, that's not recommended. Your fingers have oils and dirt, which could cause further breakouts. You can also damage your skin by pressing on it incorrectly. Instead, focus on using these product ingredients to get rid of blackheads. Look for cleansers, exfoliators and acne products that contain salicylic acid or glycolic acid or a combination of these ingredients. Retinol is also a great ingredient to get rid of blackheads. Products that include these ingredients loosen the dead skin cells and oil that are clogging your hair follicles. These ingredients can literally help unplug the follicles. These chemical exfoliators are different than the grainy exfoliators or facial scrubs. Facial scrubs only remove the dead skin cells that sit on top of your skin. They cannot remove blackheads because the scrub does not penetrate into your pore to clean it out. You can also carefully use products like Biore strips (or make your own pore strips). The key is to be gentle. Do not use them around the eyes or on a daily basis. Buy Biore Deep Cleansing Pore Strips on Amazon.com. Also consider getting a facial. During a facial your esthetician can manually remove your blackheads effectively without causing damage to your skin. Then she can recommend exactly which skin care products to use at home in order to prevent the blackheads from returning. After the Blackhead Is Removed, Can I Close My Pores to Avoid Another Blackhead? In short — no. Some people have larger pores than others, specifically people with oily skin, but we all have pores and pores do not open and close. You can, however, do your best to take good care of your skin so your pores don't become clogged. Here are some tips to keep in mind when it comes to the skin on your face. Keep your hands off your face. Whether you rest your head on your hands by habit or touch your face during the day, the oils and dirt on your hands don't need to be on your face. Check your phone. Take a look at your cellphone and I bet you see oil from your face. Clean your phone daily with an alcohol wipe. Lose the lid. If you wear a hat every day, specifically if you have oily skin, chances are good you're seeing blackheads and whiteheads on your forehead. Back off with the time you spend with a hat on your head. Exfoliate Regularly. This way you can prevent dead skin cells and oil from becoming trapped in your pores and more blackheads from forming. As we noted above using products with chemical exfoliators will help unclog your pores. Used on a regular basis you will see improvement in your skin. Remember that you can always visit a dermatologist or an esthetician, especially if your blackhead situation is severe. Dermatologists can prescribe stronger exfoliators than what you can buy over the counter and can provide in-office skin treatments for you as well such as facial peels. An esthetician can get rid of your blackheads during a facial and teach you how to care for your skin so they do not return.